A good number of boot owners declared that it runs true to size. The North Face Back-to-Berkeley Redux Leather’s insulation was effective in keeping the foot warm in cold hikes, according to numerous wearers. An abundance of hikers said that it was very light for a winter boot. It can be worn on almost any occasion—from the trails to city strolls—based on a lot of user reviews. Numerous outdoor lovers were stoked about how the Back-to-Berkeley Redux Leather kept their foot comfortable. Some hikers were disappointed with the durability of the Back-to-Berkeley Redux Leather as its sole separated from the rest of the boot too soon. The waterproofing was a letdown, according to a handful of wearers. The Back-to-Berkeley Redux Leather from The North Face brought a fresh design to winter hiking boots. Regardless of coming in a lightweight package, it was able to satisfy through its versatility and delivery of warmth and comfort. Despite these fulfilling features, it was brought down by durability issues. To conclude, the Back-to-Berkeley Redux Leather proved that it is still it is a good choice for winter hiking. It, however, may not be able to take much beating. There might not be such a thing as the perfect winter boots, but the North Face Back to Berkeley boots come very close. With a waterproof and insulated upper, the Back-to-Berkeley Redux Leather from The North Face is ready to tackle the unpredictable outdoors. It has a full leather upper lined with a HydroSeal membrane and Primaloft insulation to keep the foot safe and comfy. Providing a cushioned and supportive ride is a compression-molded EVA midsole and Ortholite ReBound footbed. It works in synergy with the boot’s outsole, the Winter Grip with IcePick lugs which reacts to trail temperature and renders surface traction. 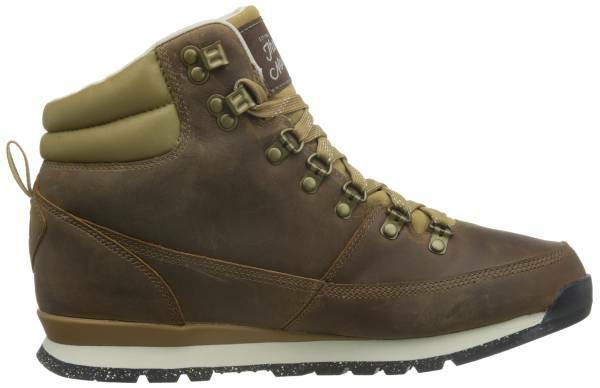 The Back-to-Berkeley Redux Leather from The North Face is a winter hiking boot for men. It comes in regular sizes and standard width. A compression-molded TPU heel clip helps secure the fit by locking the back of the foot in place. Additionally, this boot generally runs true to size. The Back-to-Berkeley Redux Leather features the brand-owned Winter Grip outsole. Its side lugs have an open construction which facilitates drainage of accumulated snow and dirt. The IcePick lugs are sensitive to outdoor temperatures. During cold hikes, it hardens and helps the boot bite on snowy grounds. In warmer conditions, this rubber softens and becomes sticky which enables it to grip on slick, wet surfaces. This mid-cut winter hiking boot has a compression-molded EVA midsole. This lightweight material is shock absorbent. It works with an Ortholite ReBound footbed which provides comfort through its long-lasting cushioning and breathability. The North Face Back-to-Berkeley Redux Leather has a durable full-grain leather upper. It has a Hydroseal membrane which keeps water from penetrating the boot. It is combined with a 100 g Primaloft Silver Insulation Eco which is made of recycled materials. This marriage of features retains heat without adding weight. Its tongue and collar are also cushioned to optimize comfort. Its lacing hardware includes D-rings and two pairs of open hooks for easier closure. The pull tab at the heel aids in on and off.